We are in Arkansas for Christmas this year, so Santa came to visit rather early. Ashlyn was so excited to see if Santa add eaten his cookies. He did. Then, she turned to stockings and presents. Christopher rode his new "bike" immediately. Now for a quick toy review. Furreal kitty. Totally cute. 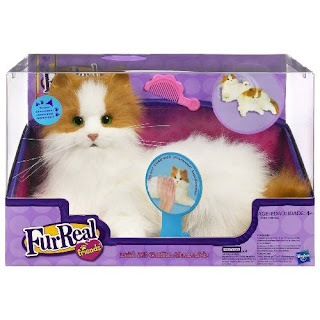 Better for a 4 year old than a real cat. (No food, litter box, it doesn't run away or get hurt.) Ashlyn loves it, far above other toys. 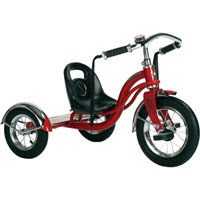 Schwinn Roadster trike. Sturdy trike, complete with a bell. Christopher loves it! 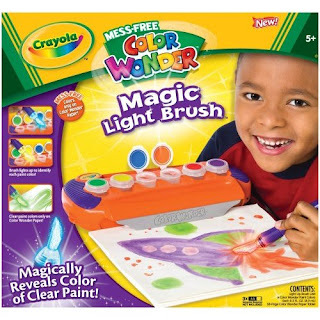 Crayola magic light brush. Return this toy! I do not like any crayola color wonder products. It takes a long time for the color to show up, even longer when you rinse your brush between colors. You can't see what you've already painted, so it is pretty limiting. The brush does light up momentarily when you first dip it into the paint, but it's pretty dumb. Crayola did a great job with their marketing to young children, though. Ashlyn really wanted it. Buy real washable paint instead. Oh on......I bought that toy for William....the ligth pen. I think I am going to have to go through the pain of it not being the greatest because it was so necessary this year. And, too funny, my parents bought the same trike for their house that Christopher has. Paulie loves the bell....I think that is the best part of the trike for him. The pedaling will come one day. Enjoy the fam time! Soak it up, we are! Have a great holida. Love you all. Thanks for the reviews. I want the bike roadster for myself. Looks awesome!